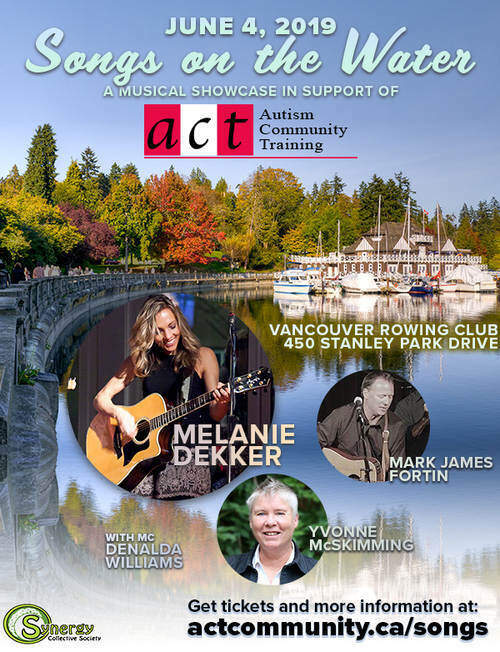 Welcome summer 2019 at the Vancouver Rowing Club, with a very special evening of music and friendship to benefit ACT – Autism Community Training. Featured artists include prominent Canadian singer-songwriters Melanie Dekker, Yvonne McSkimming, and Mark James Fortin. Dinner will feature barbequed delights – in keeping with a celebration of summer. ACT thanks the Synergy Collective Society, a community-based organization that blends art with social responsibility to support and create cooperative community programming. Each month they partner with variety of charities to build integrated partnerships between local charities, businesses and artisans. June 4th is an opportunity for the autism community and its friends to join with us for a fabulous evening in support of ACT’s free online resources. Organize a table or attend on your own. Either way you will meet old friends and make new ones! Tickets for the evening are $50.00 – a $30.00 tax receipt will be provided with purchase. Demonstrate your support for ACT’s free online resources and sponsor a table – Contact ACT for details. For more information and ticket purchases, please see the Event Page. This entry was posted on June 4, 2019 by Stephanie Porter.